Many people in the tech community are familiar with Thermaltake, and their large selection of computer accessories and cooling components. But, of lesser notoriety may be Thermaltake’s new venture, TR2TT. 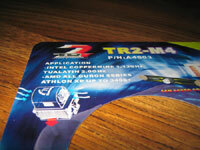 The cooling products offered by TR2TT are similar to those one would expect from Thermaltake, and according to the TR2TT website, the brand’s existence is explained with this statement: “Thermaltake Technology's newest brand, TR2, is designed and focused to provide the reliable brand & product in the price conscious market segment of the Thermal Solution industry.” One of the more interesting products from TR2TT is the subject of this review, the TR2-M4. 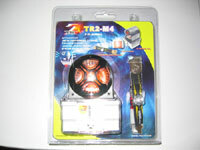 At first glance, the TR2TT TR2-M4 has a very interesting appearance. 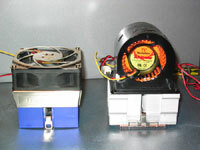 A unique fan, referred to as the X-Blower by Thermaltake, sits atop the heatsink and is designed to evenly cool the entire surface of the heatsink. The fan works well at all RPM levels, but noise sensitive users will really appreciate the TR2-M4’s available whisper quiet performance. The product is nicely packaged in a secure plastic cover that does a great job at protecting your new investment. Inside you will find everything you need to properly cool your processor. 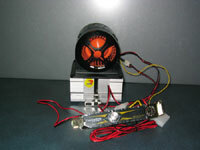 You will find the following items bundled with the TR2-M4 heatsink. The TR2-M4 is designed for Intel Coppermine 1.13GHz – Tualatin 2.0GHz and AMD processors ranging from the Duron Series up to the 3400+ Athlon XP. The package as a whole has very good quality. 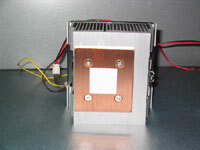 The heatsink features a copper base that comes with a factory installed thermal pad. 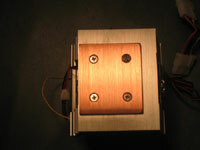 Once the thermal pad is removed it reveals a smooth copper surface. With Arctic Silver III as our thermal paste the copper base will ensure a good bond between the heatsink and CPU. Also worth noting is the convenient fan controller that fits into an empty PCI slot. The fan controller knob has sufficient resistance when turning and has a notch that makes it easy to identify the current fan speed. Installation of the TR2-M4 was a breeze. 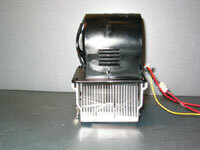 The instructions are very thorough and cover everything from properly mounting the heatsink, to connecting the wires, and finally to installing the fan controller. 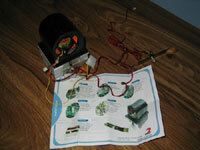 These instructions will be most useful to people without prior heatsink installation experience. I have included a comparison between the Thermaltake Volcano 7 and the TR2-M4 for you to observe the size differences. As you can see the TR2-M4 is a bit taller than the Volcano 7. Otherwise, the two coolers are nearly the same dimensions.